To better serve our client’s whom do not have easy access to patient datasets for custom silicone models, BDC Laboratories also offers a library of standard anatomical vessels, representative of both healthy and diseased states. These models can be purchased with our standard geometry and dimensions or through our expert team, any and all vessel attributes can be modified to your requirements. With specialized computer aided design software, the modified model is available for review prior to build to ensure the final product will align with your expectations. BDC can also fabricate our silicone mock vessels with embedded radiopaque markers integrated into the wall to support fluoroscopic and X-ray imaging-based studies. Radiopaque markers can be integrated at any location in the model to meet your requirements in support of its use for device evaluations such as deployment accuracy testing. This library is continually expanding over time so keep checking back for updates. The images shown in the catalog below are presented in red for illustration purposes only, all final silicone vessels are clear for viewing and in situ analysis of your endovascular and heart valve technologies. SKU: SACOA-2D1 | Lumen: 2D, Normative. A silicone 2-dimensional aorta vessel from above the sinotubular junction, including the aortic arch with access through the short brachiocephalic, left common carotid and left subclavian arteries and distally through the iliac vessels with geometry consistent with healthy anatomy. This 2D anatomy lies flat in one plane. The Iliac access points allow convenient mounting of the anatomy onto barbed fittings or hemostats. This anatomy can be attached to the optional Aortic Root (SKU: SAAV), a functional aortic valve with sinus, to create a complete Descending Aorta with Arch. 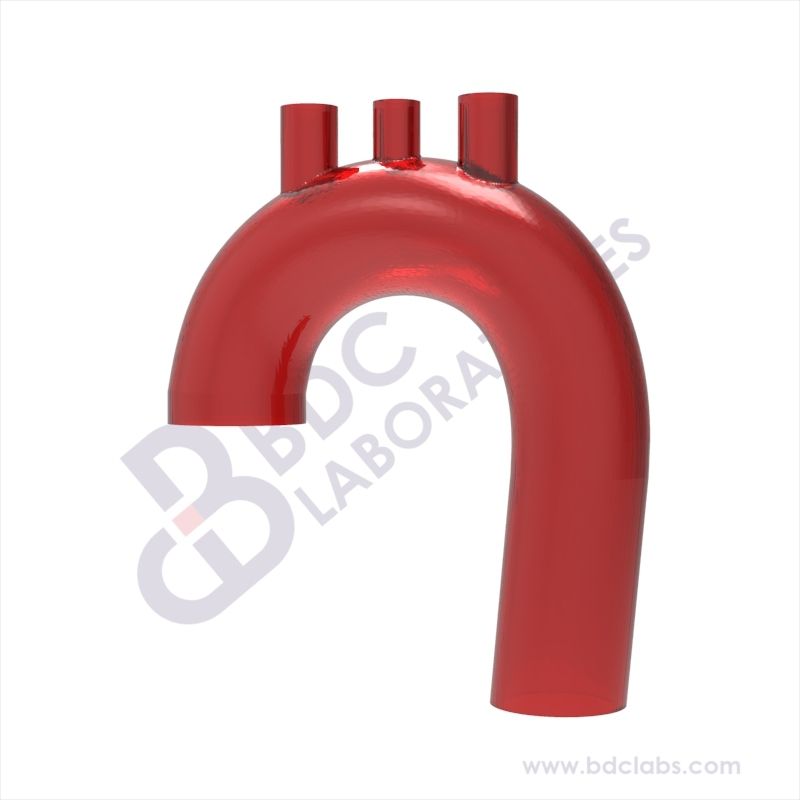 The Descending Aorta with Arch can be used for marketing, testing, demonstration and training purposes for a wide range of applications. When used with the optional Aortic Root (SKU: SAAV), the Descending Aorta with Arch can also be used for the Transcatheter Aortic Valve Repair/Replacement (TAVR), or Transcatheter Aortic Valve Implantation (TAVI) simulation, via Transfemoral or Transapical Approach. The Descending Aorta with Aortic Arch can also be attached to the optional Carotid Arteries and Circle of Willis anatomy (SKU: SANVV-H) to simulate endovascular procedures for the treatment of stenoses with the use of intravascular devices such as stents, coils, Flow Diverters and Pipeline Embolization Devices. 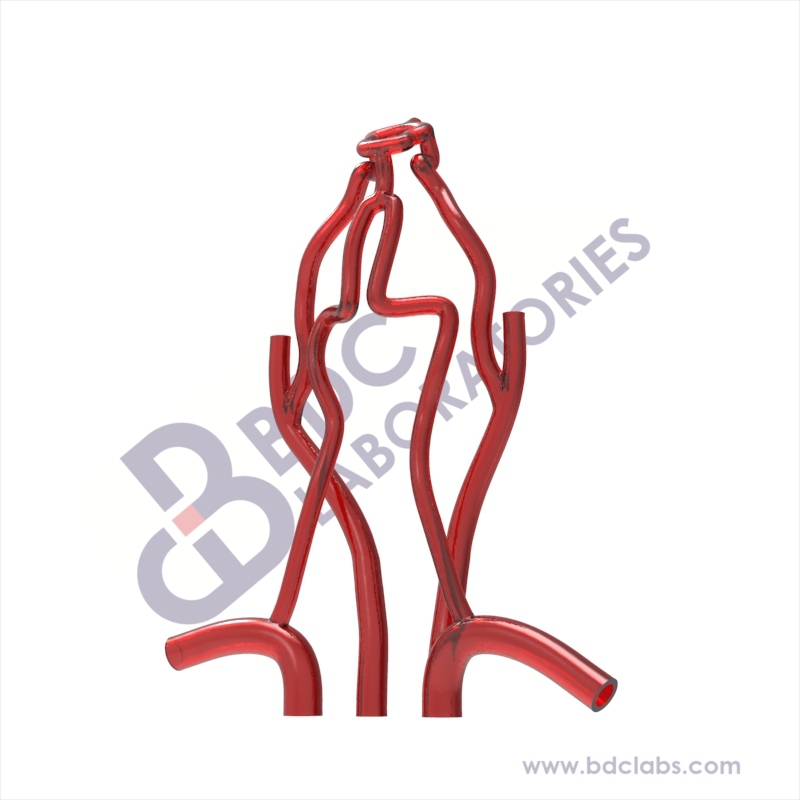 A range of optional accessories from BDC Labs is available here, to set up a Mock Circulatory Loop (MCL) or a simulation system incorporating the Descending Aorta with Arch. SKU: SACOA-3D1 | Lumen: 3D, Normative. A silicone 3-dimensional aorta vessel from above the sinotubular junction, including the crenel aortic arch with access through the short brachiocephalic, left common carotid and left subclavian arteries and distally through the iliac vessels with geometry consistent with healthy anatomy. This 3D anatomy allows better representation of the spatial configuration of the vascular tree. SKU: SANVV-H | Lumen: 3D, Normative. A neurovascular vessel anatomy starting from the Aortic Arch branch vessels, distal through the Circle of Willis region, and including the Vertebral, Internal and External Carotid Arteries. The distal branch vessels of the anatomy can be attached to the corresponding vessels in the optional Aortic Arch (SKU: SAAAR-2DH) or Descending Aorta with Aortic Arch (SKU: SACOA-2D) with barbed fittings. The Carotid Arteries and Circle of Willis can be used for marketing, testing, demonstration and training purposes for a wide range of applications. The Carotid Arteries and Circle of Willis anatomy can also be used to simulate endovascular procedures such as Carotid Artery Stenting for the treatment of Carotid Artery Stenosis, as well as endovascular procedures for the treatment of intracranial aneurysms including stenting, coiling, Flow Diverters, and Pipeline Embolization Devices. 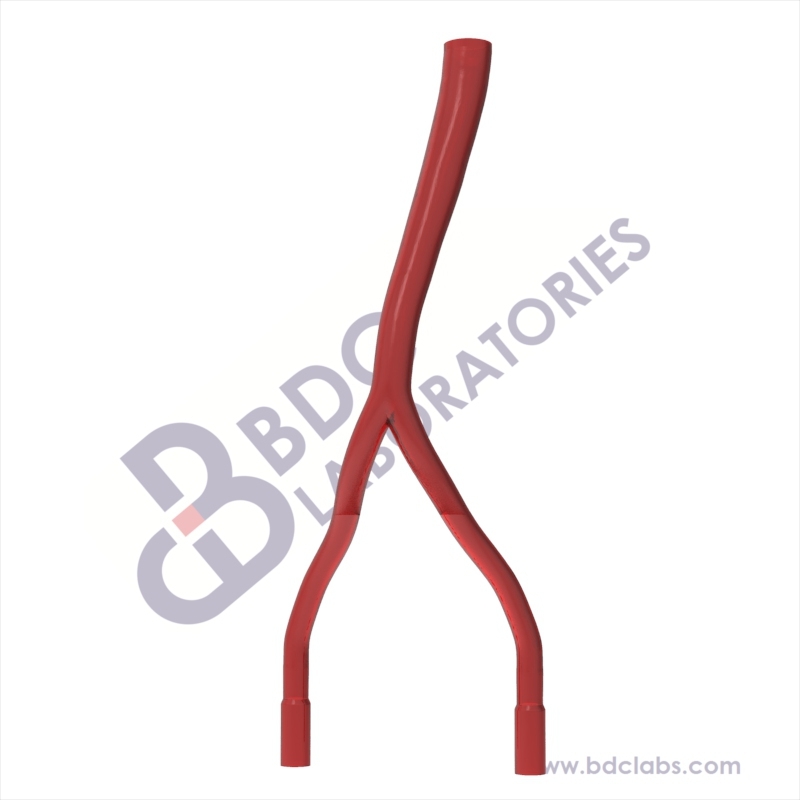 A range of optional accessories from BDC Labs is available here, to set up a Mock Circulatory Loop (MCL) or a simulation system incorporating the Carotid Arteries and Circle of Willis. SKU: SAAAR-2DH | Lumen: 2D, Normative. A 2-dimensional clinical aortic arch vessel with main branch vessels present. The primary radius of curvature or Romaneque curvature is appropriate for a patient with healthy arch region. The Arch offers access via the short brachiocephalic, left common carotid and left subclavian arteries. The Arch can be attached to the optional Descending Aorta (SKU: SADA-2D) distally and to the Aortic Root (SKU: SAAV). The Healthy Aortic Arch can be used for marketing, testing, demonstration and training purposes for a wide range of applications. When used as a part of a complete Descending Aorta with Aortic Root, the Arch can also be used for the Transcatheter Aortic Valve Repair/Replacement (TAVR), or Transcatheter Aortic Valve Implantation (TAVI) simulation, via Transfemoral or Transapical Approach. The Aortic Arch can also be attached to the optional Carotid Arteries and Circle of Willis anatomy (SKU: SANVV-H) to simulate endovascular procedures for the treatment of stenoses with the use of intravascular devices such as stents, coils, Flow Diverters and Pipeline Embolization Devices. 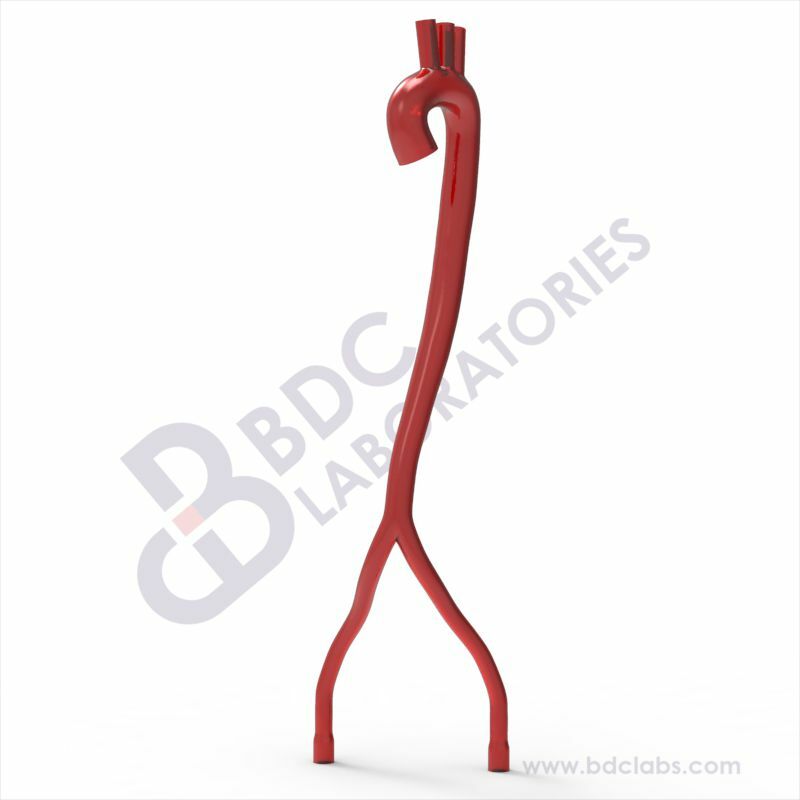 A range of optional accessories from BDC Labs is available here, to set up a Mock Circulatory Loop (MCL) or a simulation system incorporating the Aortic Arch. SKU: SADA-2D1 | Lumen: 2D, Normative. A Descending Aorta with iliac vessels in a 2-dimensional plane consistent with the geometry of healthy anatomy, with access distally through the iliac vessels. This 2D normative anatomy lies flat in one plane. The iliac access points allow convenient mounting of the anatomy onto barbed fittings or hemostats. This anatomy can be mated with optional healthy or diseased Aortic Arch models and with the Aortic Root (SKU: SAAV), to create a complete Descending Aorta with Arch. 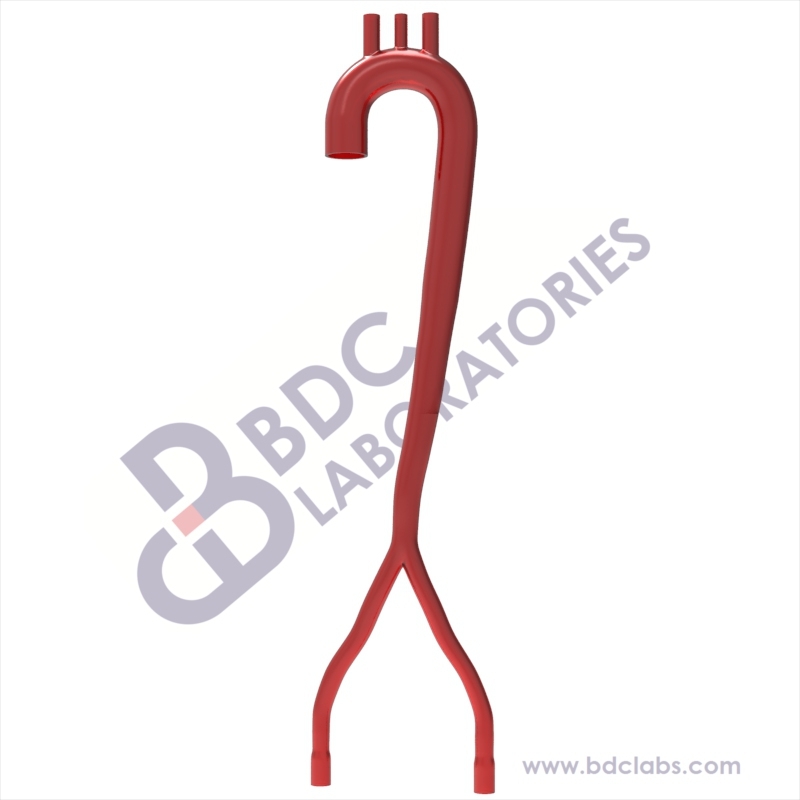 The Descending Aorta can be used for marketing, testing, demonstration and training purposes for a wide range of applications. When used with the optional Aortic Root (SKU: SAAV), and healthy or diseased Aortic Arches, the Descending Aorta can also be used for the Transcatheter Aortic Valve Repair/Replacement (TAVR), or Transcatheter Aortic Valve Implantation (TAVI) simulation, via Transfemoral or Transapical Approach. The Descending Aorta with the optional Aortic Arch can also be attached to the optional Circle of Willis anatomy to simulate endovascular procedures for the treatment of stenoses with the use of intravascular devices such as stents, coils, Flow Diverters and Pipeline Embolization Devices. 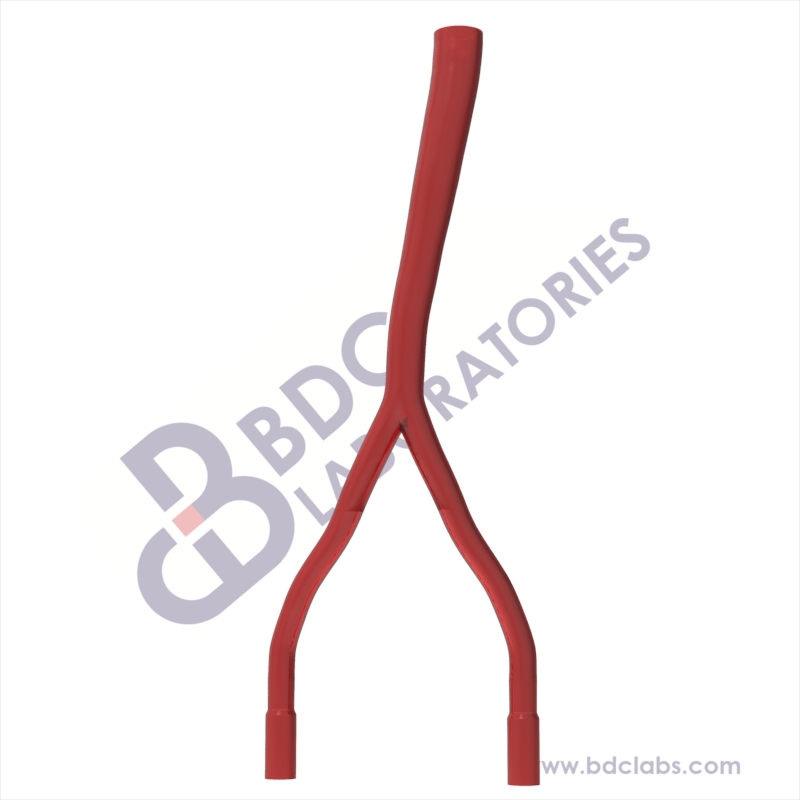 A range of optional accessories from BDC Labs is available here, to set up a Mock Circulatory Loop (MCL) or a simulation system incorporating the Descending Aorta. SKU: SADA-3D1 | Lumen: 3D, Normative. A Descending Aorta with iliac vessels in a 3-dimensional plane consistent with the geometry of healthy anatomy, with access distally through the iliac vessels. This 3D normative anatomy allows better representation of the spatial configuration of the vascular tree. SKU: SBRU-1 | Lumen: 3D, Normative. The Brachial/Radial/Ulnar Artery model extends from the axillary artery region down to the radial and ulnar arteries. Access is provided through the radial and ulnar arteries. The Brachial/Radial/Ulnar Artery model can be used for marketing, testing, demonstration and training purposes for a wide range of applications. This model can also be used to simulate Percutaneous Coronary Interventions (PCI) and a range of other endovascular procedures where transradial access (TRA) is an increasingly frequent option. 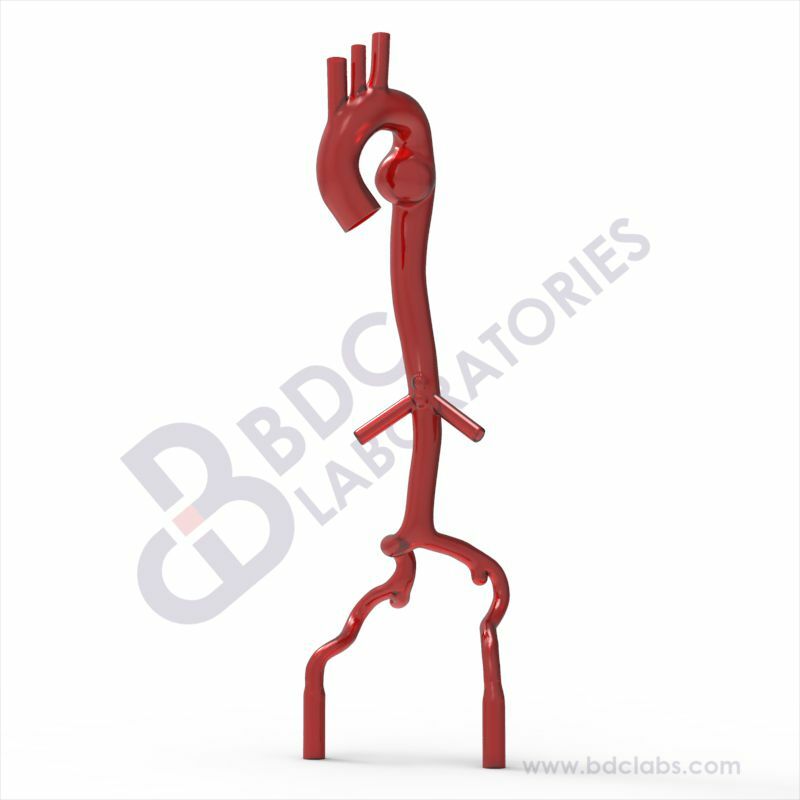 A range of optional accessories from BDC Labs is available here, to set up a Mock Circulatory Loop (MCL) or a simulation system incorporating the Brachial/Radial/Ulnar Artery model. SKU: SAWL-1 | Lumen: 3D, Normative. The Whole Leg Arterial model extends from the iliac artery, down through the common, deep and superficial femorals, to the popliteal, anterior and posterior tibial, and peroneal arteries. Access is obtained at multiple points of the arterial model. The Whole Leg Arterial model can be used for marketing, testing, demonstration and training purposes for a wide range of applications. This model can also be used to simulate Peripheral Artery Disease (PAD) interventions and a range of other endovascular procedures where iliac, femoral or tibial access is required. 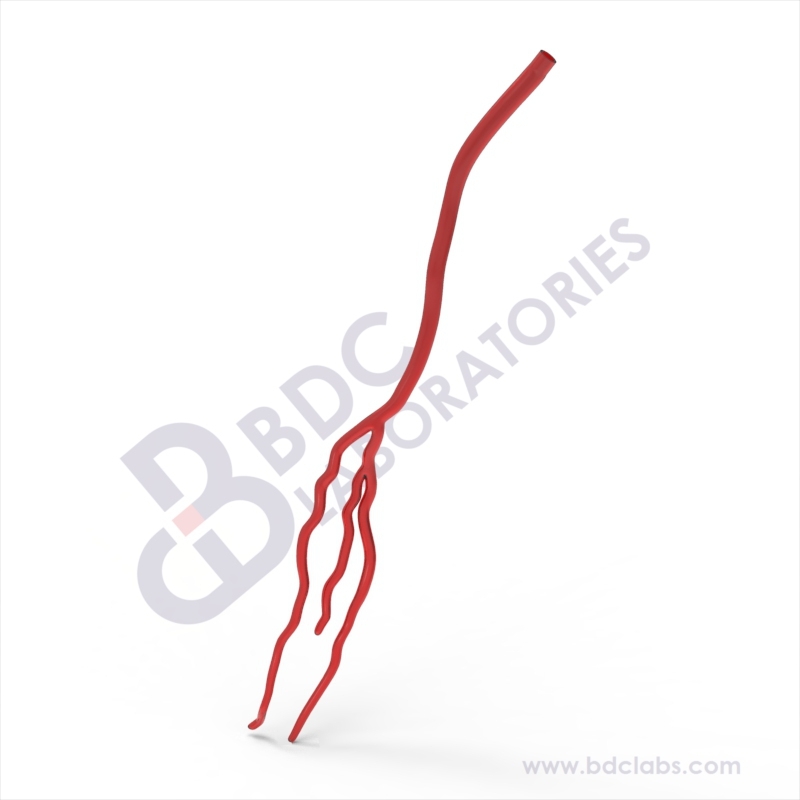 A range of optional accessories from BDC Labs is available here, to set up a Mock Circulatory Loop (MCL) or a simulation system incorporating the Whole Leg Arterial model. The Whole Leg Arterial model is also available in two parts, as an Upper Leg Arterial model and Lower Leg Arterial model upon request. SKU: SATAA-1 | Lumen: 3D, Normative. A Thoracic Aortic Aneurysm (TAA) model with localized aneurysm in the descending aorta. Iliac vessels with moderate tortuosity and short renal vessels are present. Access is through the short Brachiocephalic, Left Common Carotid and Left Subclavian Arteries on the Aortic Arch and distally via the Renal Arteries and Iliac Arteries. This 3D normative anatomy allows better representation of the spatial configuration of the vascular tree. The Iliac access points allow convenient mounting of the anatomy onto barbed fittings or hemostats. This anatomy can be attached to the optional Aortic Root (SKU: SAAV), a functional aortic valve with sinus, to create a complete Descending TAA. The Thoracic Aneurysm Vessel can be used for marketing, testing, demonstration and training purposes for a wide range of applications. This TAA can also be used to simulate endovascular procedures involving the bridging of the aneurysm with a stent graft that are a part of Thoracic Endovascular Aortic Repair (TEVAR) procedures. 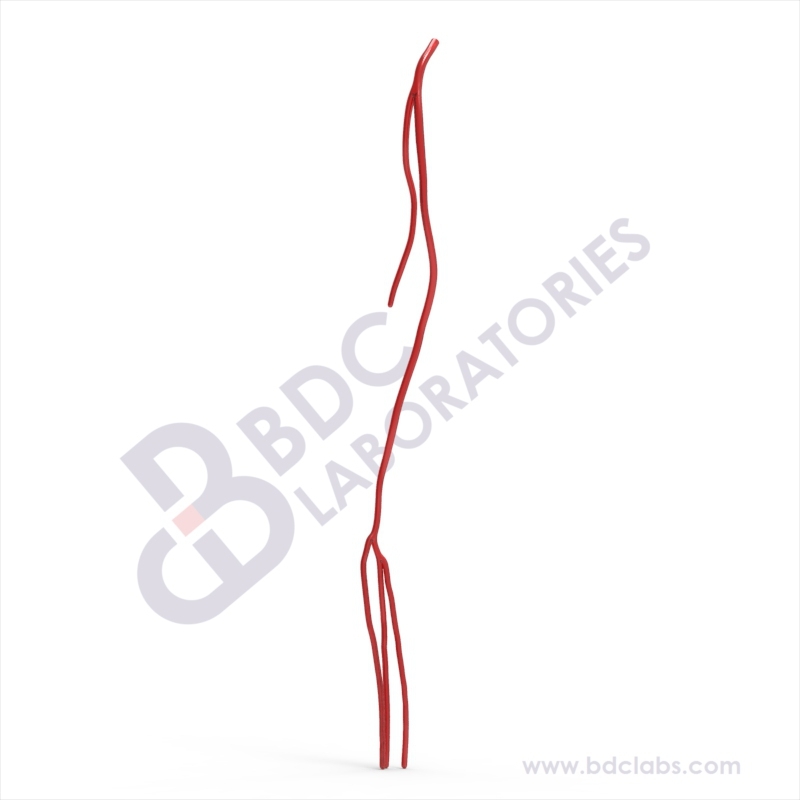 A range of optional accessories from BDC Labs is available here, to set up a Mock Circulatory Loop (MCL) or a simulation system incorporating the TAA. SKU: SATAA-2 | Lumen: 3D, Clinical. A clinical Thoracic Aortic Aneurysm (TAA) model with aneurysm from descending aorta distal to renal region. Iliac vessels with moderate tortuosity and short renal vessels are present. Access is through the short brachiocephalic, left common carotid and left subclavian arteries on the aortic arch and distally via the renal arteries and iliac arteries. The TAA can also be used to simulate endovascular procedures involving the bridging of the aneurysm with a stent graft that are a part of Thoracic Endovascular Aortic Repair (TEVAR) and Fenestrated Endovascular Aortic Repair (FEVAR).